Rights, by definition, are granted by higher authorities. Humans have no right to make up their own set of rights nor can they decide on animal rights. Prisoners cannot create their own rules. That would only increase their prison term. The increasing amount of suffering on our planet today is a result of defying God's authority. 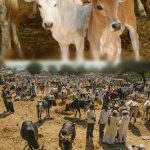 Following the recent nationwide ban on the sale of animals for slaughter, Indian government is facing protests in a few states where animal slaughter is seen as a means of earning political popularity and livelihood. A barbaric incident involving several youth Congress members in Kerala was condemned even by the party high command while rest of the country is watching how the BJP government curbs such inhumanly and cowardly acts. There are reports that to ease the tension, the government is mulling options to alter the rule. One good reason behind this is to keep anti-social, barbaric elements from killing innocent animals during their protest. 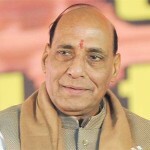 Ideally, those who defy central government rules on animal slaughter should be immediately arrested and punished by the state government itself, but due to present political scenario in India, states having non-BJP governments have started thinking that they have the freedom to not follow central government ruling. We saw such attitude recently when the center passed a legislation on the use of beacons on VIP vehicles. State governments need to realize that if the situation warrants, the central government can impose president’s rule in the state and bring it under center’s control. As mentioned in a previous article, the claims that animal slaughter bans hamper country’s economy or are against human rights are baseless. India was more prosperous before it started exporting beef and it will regain its number 1 place in the world if Indians stop killing cows and animals for money. This is a simple and verifiable fact based on statistics and experience but certain class of people is unable to accept or admit it. 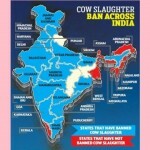 The non-political question is, do we, or the governments, central or state, have any right to decide on animal slaughter based on human rights? Before getting into human rights and animal rights, we first need to understand the definition of rights. Rights, by definition, are granted by higher authority. In a civilized society no one can grant rights to oneself. It is madness to think that humans can create their own list of rights without considering that they are ruled by higher beings. If they were not ruled by higher beings, humans would have decided to not suffer, not grow old, not get diseases and not die. But despite their relentless efforts to defy these compulsions, they are constantly forced to suffer, grow old, get disease and die. Not only animal rights, humans have no right to decide on even their own rights. Prisoners cannot create their own set of rights. That would only increase their prison term. Both human and animal rights are granted by none other than the creator and master of both, the almighty God, the Supreme Personality. Like it or not, the reality is, we are all put in a prison house controlled by Ma Durga, who represents the invincible potency of the Lord, for having defied God’s authority. The different types of miseries, physical or mental, imposed upon us is a proof that we are captured, for in factual freedom there is no misery. Any living being, human or animal, who takes birth in a state has the primary right to live under the protection of the king. In Sanskrit, praja refers to one who has taken birth in the state, and this includes both men and animals. Not to speak of holy cows who are blessed with unfathomable qualities and compassion towards human beings, even jungle animals are subject to the king and have a right to live. According to the law of karma, if a person is suffering from poverty, it is because of his past sinful actions. Past does not mean only the past in this life; rather it is more about previous life or lives. 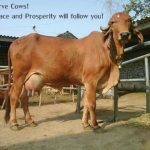 If such persons are again encouraged or allowed to engage in heinous crimes like killing of cows and animal slaughter, they are destined to not only lose their livelihood but lose their very human body in the next life and take birth through animal wombs to suffer the reactions of actions performed during this life. 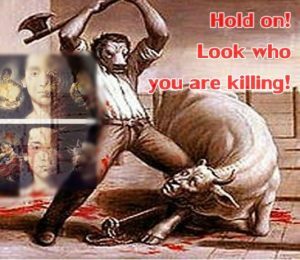 It is an illusion to think that allowing animal slaughter will help people earn livelihood. It is rather sending them to lower species of life where they are forced to suffer horrendous reactions. It is wise to accept the authority of God and behave like human beings when we are given the opportunity. It may be easy to say “I don’t care” or “I don’t believe”, but when time comes to pay off, those engaged in animal slaughter have no one to save them. And the time will come. Getting frightened at the time of death is a sign of the next miserable life. There are recorded instances when people have seen ferocious living beings at the time of death. These ferocious beings are crime-handling agents of Yamaraja, who is in charge of hellish planets, and they come at the time of death to take the sinful soul to lower part of the universe where different types of hellish planets are located. This is not mythology nor is it grandma’s tale. It is a perceivable reality experienced by millions. Better keep away from it. Truth does not change by disbelief nor is ignorance an excuse when it comes to the law of karma. 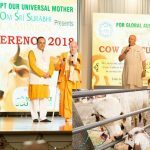 In light of this vedic wisdom it is imperative that no government takes the law of animal slaughter in its hand whimsically and allows it based on thoughtless demands from a handful of people. If the leaders are true well-wishers of citizens then they should rather stop them from committing animal slaughter as that will save people from miserable future. Or else, suffering in this life and greater suffering in the next is waiting. The best part is, the law of karma does not change as per the whims of changing worldly rulers.